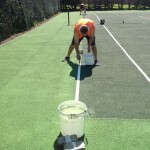 UK tennis court line marking paint is either a polyurethane coating or a porous acrylic paint coating depending on the surface. Each of these specialist paints has an aggregate built into the coating that helps increase the traction that players have when using the court. This allows for reduced chances of injury caused by slipping or skidding. It’s conventional to have colours that contrast each other to make playing easier due to being able to recognise whether the ball was in or out. 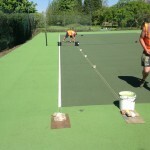 It is important that when choosing a contractor to carry out UK tennis court line markings that you conduct a thorough credit check and make sure that they have all the necessary accreditations and certifications to carry out the job to a suitable standard that fit in within the TF, SAPCA and LTA guidelines and specifications. Get in touch with our experts today to find out more about the range of services that we offer. 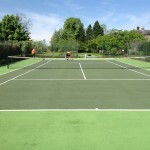 Complete the contact form on this page and let us know what you need so we can provide a great value quote on tennis court markings. 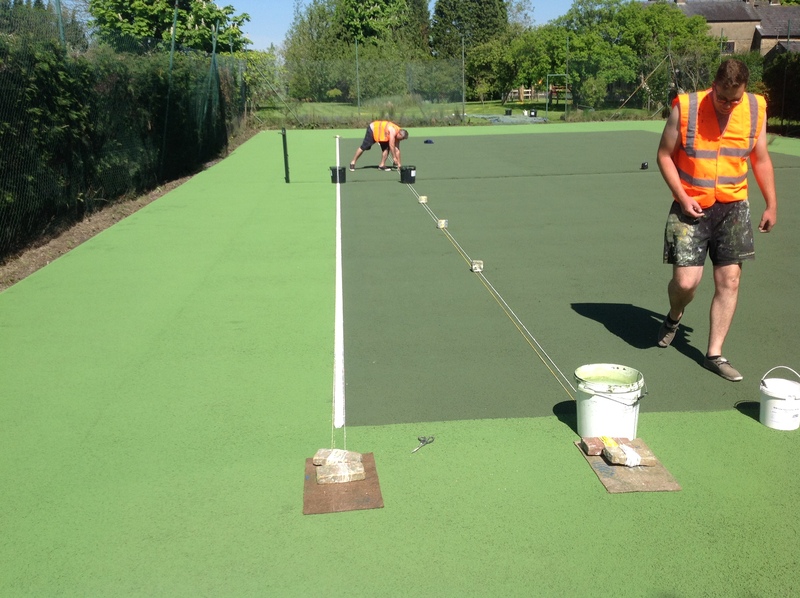 For the use of your MUGA sport surface in a professional manner, the line markings need to be to a specific size and dimension. 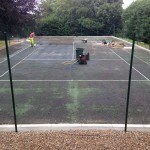 The area size for the court will typically be 23.77m x 10.97m with the lines being a total of 50mm width ways. However if the court is being used for casual and recreational games the dimensions may vary and can be tailored to suit your requirements and specifications. 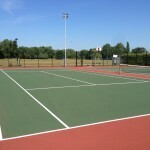 We can install markings for both of these purposes to help you give your players the best playing experience while still keeping the court within your available area size requirements and budget for the whole project. 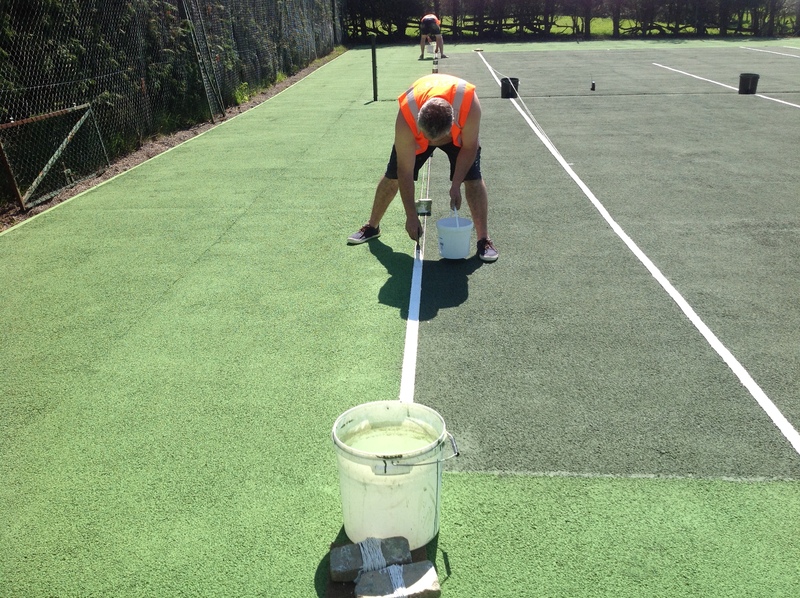 Professional line marking can be applied to outdoor activity areas of different surfacing specifications including porous macadam, artificial grass and polymeric rubber, the high quality line markings will provide accurate game scoring qualities when playing on any tennis surface. This is necessary if you want to use the facility to LTA playing standards for competitive events and matches. 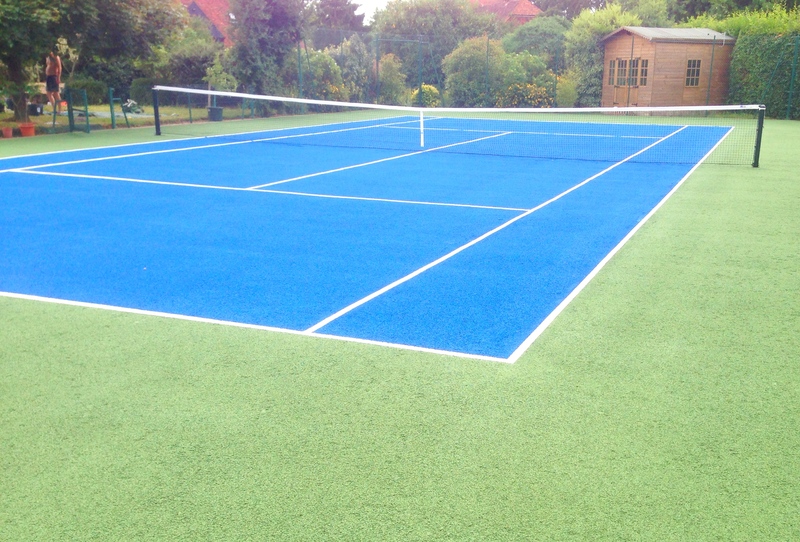 You’re able to choose from a range of different colour options, and we can also add lines in a number of colours for use with additional sports like netball or basketball. Tennis court markings costs may vary depending on a few factors. 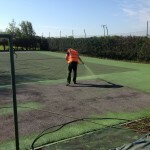 For the surface to be repainted effectively we have to make sure that the flooring is completely clean and hasn’t got any contamination from moss or algae; this could attribute to additional costs before we can carry out the job at hand. However the main factor that needs to be taken into account for the price of tennis court relining is the size and dimensions of the facility. So if the courts are to the professional size and dimensions the price will not vary too much. However for facilities that need to stay within a tight budget and help keep costs to a minimum you are more likely to get a reduced rate if the area is smaller. The video below shows the process of relining a sports court which had become dirty and unsafe for use. Firstly our team carried out a thorough clean to the surface to get rid of the moss and dirt which was stuck to the macadam. Once the flooring was completely clean we applied a new anti slip coating in blue acrylic paint with green around the perimeter for the runoff area. 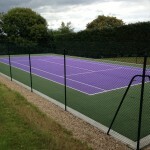 Finally we applied new line markings in white to create an accurate game playing surface for tennis. As a specialist outdoor sport surface contractor, we offer a variety of services from full construction to after care maintenance of facilities in numerous specifications. 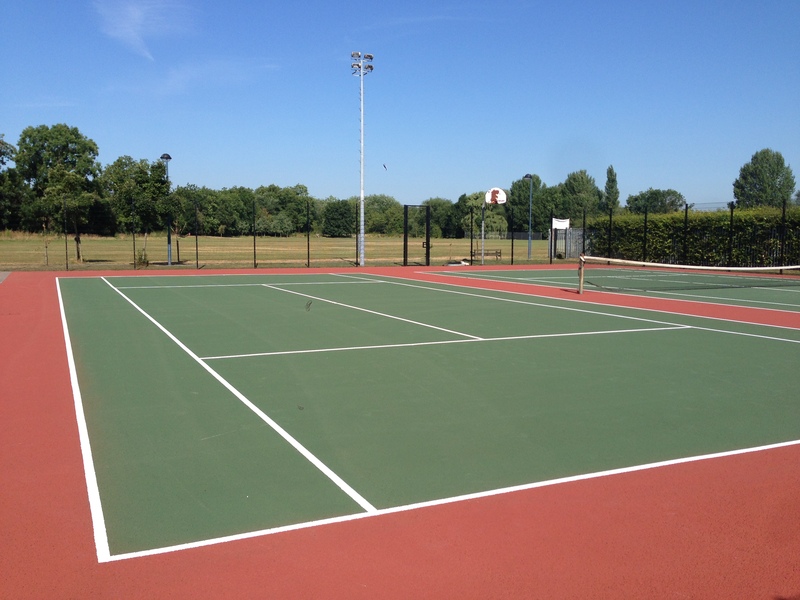 Macadam, polymeric rubber and synthetic grass are all popular surface types for tennis and we can design, install and apply markings for each of these. The overall design is completely up to you and how you would like to use the facility. If you have a particular budget in mind we can discuss this with you and make sure we offer a quote which is affordable. Be sure to tell us about any specific requirements you have so we can tailor our service to this as much as possible. We always aim to offer the best value services for all of our clients when it comes to price and quality. Each project we carry out is customised so you can be sure you’ll get exactly what you want. 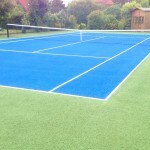 Please feel free to contact us if you need a quote to carry out tennis court line marking in porous acrylic paint for your outdoor sports facility and we will gladly send you over some product sheets with an idea of costs for your particular facility. If you fill in the contact form on this page with your details including a post code and area size for the project, we’ll be able to offer you an accurate quote to complete the work.